This series was made possible by a grant from USAID. Forest people have managed their land sustainably for hundreds – and sometimes thousands – of years. They have, as a result, contributed the least to climate change, but they may suffer the most from its consequences. If that happens, their suffering will become our suffering as forests degrade and disappear, releasing billions of tons of carbon dioxide into the atmosphere. That’s why environmental NGOs advocate for “Reducing Emissions from Deforestation and Degradation”. Thanks to their efforts, companies, governments, and individuals have voluntarily invested billions in climate action over the last quarter century, and now governments around the world have pledged more than $7 billion to REDD through the end of this year. This article series Ecosystem Marketplace offers an accessible introduction to avoided deforestation actions and how they’re financed – and especially how it relates to indigenous people. ChocÃƒÂ³-DariÃƒÂ©n: What Projects Can – and Cannot – Achieve offers a deep dive into a project developed by the Afro-Colombian Tolo River People – and a primer on how REDD plays out on the ground. Indigenous People Build Fund For Direct Access To Climate Finance explores how indigenous groups of the Amazon are solving the funding flow problem with an independent indigenous fund. Hundreds of millions of dollars in climate finance have been pledged to helping indigenous people manage their territories, but all of that money is currently trapped in intermediaries. Here’s how the Amazon’s largest federation of indigenous organizations aims to change that. 24 June 2015 | BONN/BARCELONA | Indigenous leader Juan Carlos Jintiach says he was ecstatic when governments around the world pledged $1 billion to end deforestation at last year’s climate summit in New York. He especially liked Norway’s pledge of $20 million per year to help indigenous people secure their rights. But he also knew what would happen next, as NGOs around the world quickly submitted proposals, and Norway issued a short-list of 53 finalists. “In the end, only five indigenous organizations were invited to present final proposals,” says Jintiach, who at the time had just stepped down as Director for Economic Development of pan-Amazonian indigenous federation COICA. 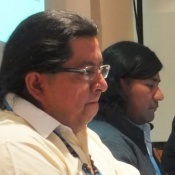 Left-to-Right: Juan-Carlos Jintiach (COICA), Jorge Furagaro Kuetgaje (COICA), Josien Tokoe (COICA), and Estebancio Castro Diaz (International Alliance of Indigenous and Tribal Peoples of Tropical Forests) at climate talks in Bonn. Chris Meyer of the Environmental Defense Fund (EDF) says that at least $50 million in funding linked to reduced deforestation or “REDD+ finance” has already been allocated for indigenous people, but it’s in limbo, scattered among the Forest Carbon Partnership Facility, the UN-REDD Program, and the Forest Investment Program – and that’s after he deducts 20% for administration and overhead. In the last few years of his tenure, Jintiach had a front-row seat at the “grant games”, as COICA teamed up with NGOs like EDF, Woods Hole Research Center, and even Ecosystem Marketplace publisher Forest Trends to secure direct funding from large donors like the United States Agency for International Development (USAID), which is supporting COICA and a consortium of NGOs (including Forest Trends) under a program called AIME, which among other things helps indigenous people position themselves for REDD+ finance. Current COICA director Edwin Ví¡squez Campos has been working to ready the organization and its members for REDD+ finance, and at mid-year climate talks in Bonn, COICA’s head of Environment, Climate Change and Biodiversity, Jorge Furagaro Kuetgaje, announced the creation of an Indigenous Amazon Fund, which is the brainchild of COICA consultant Roberto Espinoza and is designed to act as a kind of central bank for indigenous people across the Amazon. Two weeks later, Campos announced that COICA would also seek to establish a more forceful presence in multilateral organizations like the Governors’ Climate and Forests (GCF) Task Force, which is a network of subnational governments and governors working to address climate-change multilaterally. At the GCF annual meeting in Barcelona, COICA was joined by Central America’s AMPB, the Mesoamerican Alliance of Peoples and Forests. COICA’s statement was more prescriptive and called for active indigenous participation in the development of national climate action plans, or INDCs (Intended Nationally-Determined Contributions), and asked for a signed agreement with the GCF recognizing COICA participation in strategic planning and implementation. Jintiach, who now is an analyst in COICA’s Economic Development Cooperation, says the Indigenous Amazon Fund is being created based on feedback from donor nations and with support from EDF and other NGOs. The fund proposal will be refined at a series of COICA meetings, beginning in August, but Jintiach and Meyer both say some basic ground-rules have already been established. The Indigenous Amazon Fund is designed to be an independent entity answerable to an outside board of directors. Based on donor feedback, COICA and others are now suggesting the creation of a non-profit entity, with an independent board of directors as well as an advisory board, says Meyer. Although REDD+ finance was the impetus for creating the fund, it’s ultimately designed to handle banking, loans, and other financing operations. “Something like Canopy Bridge, which is a platform for indigenous producers to market their products, could be supported through the fund,” says Meyer. He says an Indigenous Amazon Fund would better be able to assess indigenous programs for their viability because it would be run by people who understand indigenous business practices. Jintiach expects to have a formal proposal by the end of August, and Meyer estimates the start-up costs at less than $1 million. Read COICA’s statement (Spanish) to the GCF here. Steve Zwick is Managing Editor of Ecosystem Marketplace. He can be reached at szwick@ecosystemmarketplace.com. Kelli Barrett is a freelance writer and editorial assistant at Ecosystem Marketplace. She can be reached at kbarrett@ecosystemmarketplace.com.